Posted on October 3, 2012 by Alicia Bay Laurel	in Books and tagged 1st edition, 4th edition, electronic press kit. 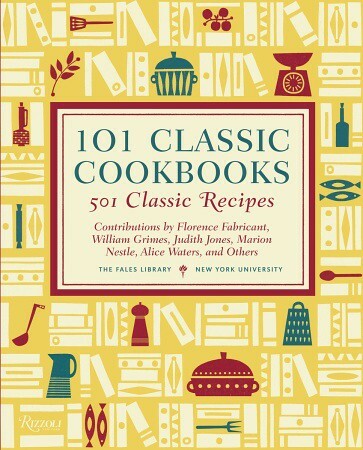 On October 24th and 25th, 2012, Rizzoli Publishers (Random House, New York) unveiled 101 Classic Cookbooks – 501 Classic Recipes, a collection edited by Marvin J. Taylor, Director of the Fales Library and Special Collections at New York University, home to over 55,000 volumes about food, and Clark Wolf, a New York-based food and restaurant consultant. Their panel of culinary experts, including food writer and academic Michael Pollan, Los Angeles Times food critic Jonathan Gold, New York Times food critic Florence Fabricant, and chef, food writer, and PBS producer Ruth Reichl, chose what they consider the most influential American cookbook for each year of the 20th century, and, from those, the quintessential recipes of each book. From Living on the Earth, they chose four recipes: Dandelion Wine, Sunflower Milk (actually, How To Make Baby Food), Yogurt, and How to Smoke Fish. 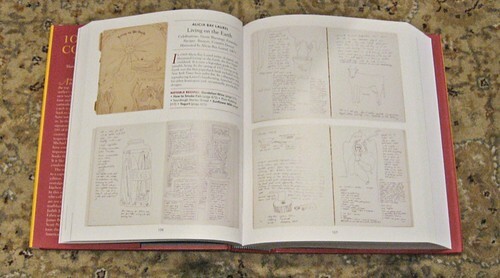 In addition, six of the original illustrated and hand-lettered page layouts, plus the cover of the Random House second edition are displayed on pages 136 and 137. Other authors included in the book include Julia Child, Irma S. Rombauer and Marion Rombauer Becker, Alice Waters, Martha Stewart, Fanny Farmer, Madhur Jaffrey, Molly Katz, and Laurel Robertson. Here‘s a video of a panel discussion by some of the major organizers and contributors to the book, on October 25, 2012 at New York University. Posted on December 10, 2006 by Alicia Bay Laurel	in Books. December 31, 2018: El Mundo, one of the most esteemed journals in Spain, published an article about Ramón Sender Barayon, and the documentary film about his life and work written and directed by Luis Olano. In the above photo, taken in 2004, I visited Ramon Sender Barayon and his wife Judith Levy Sender in Noe Valley, San Francisco. 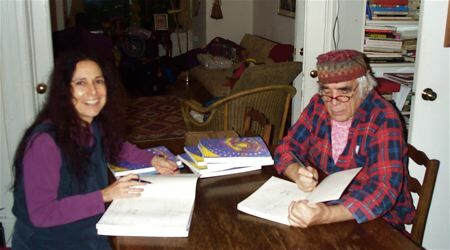 Ramón and I each signed each of our remaining copies of our book, Being of the Sun, saved over countless moves since 1973, when it was published by Harper & Row, Publishers. In the early ‘70’s, Ramon and I wrote Being of the Sun, released as the sequel to Living on the Earth. The book’s central premise is that each person can find his or her own to way to a dialogue with the Divine, without middlemen, hierarchy, or externally imposed rules of living, while borrowing practices from many traditions to enhance this dialogue. We then offered, as an example, various practices that we found useful. Ramon’s unique contributions stem from his practices of meditation on sunlight and his background as an avant-garde composer and musician. He was, along with Mort Subotnick, Pauline Oliveros and Terry Riley, one of the composers who formed the San Francisco Tape Music Center in the early 1960’s, and collaborated with audio engineer Don Buchla and Mort Subotnick in the invention of first synthesizer built on the West Coast, the Buchla Box (which was contemporary with the Moog, built on the East Coast). 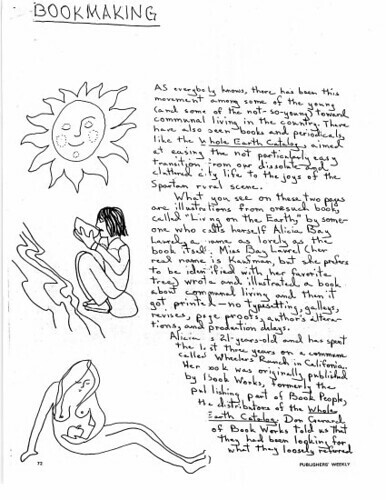 My illustrations in Being of the Sun are far more lush, imaginative and colorful than those in Living on the Earth, and I bravely offered a drawing of a beautiful young woman defecating into a hole in the earth. Twenty-seven years after its publication, I recorded some of the songs from the book on my first CD, Music From Living on the Earth. Being of the Sun was initially not well received; in 1973, Rolling Stone declared it “the worst gift book of the year.” However, in the intervening years, it’s become a cult classic, often referenced on Pagan/Wiccan websites, the illustrations pirated into various alternative journals. The Japanese translation of Being of the Sun from Soshisha, Ltd., originally published in 1972, came back into print in 2007. Since then, I’ve been licensing the illustrations to fashion designers in Japan. Here is a write-up in Japan Vogue from May 25, 2015, about the Salon de Balcony summer fashion line, which includes clothing and accessories printed with illustrations from Being of the Sun (scroll to the bottom of the page). In 2019, Kachina Ediciones, in Albacete, España, will be releasing a first-ever Spanish edition. Here is the cover! This edition will have the original colors that I used – unlike the Harper & Row and Soshisha editions, which changed the color pallette to suite their own aesthetics. In 2013, Indigo With Stars, Inc. released “Songs from Being of the Sun,” a remastered version on CD of an archival reel-to-reel recording made by Ramón Sender Barayon in 1973, of me and Ramón performing some of the sacred nature chants we created for Being of the Sun, just before it was published. It’s available as a physical CD here, or either as a CD or as a download from CD Baby. “Being of the Sun is an enchanted Solar Mass of relaxing, charming, seductive sounds. If I could pop into the book version like a superflex Gumby, this musical soundtrack would rejuvenate me – and I can’t wait to meet all of the colorful sun children. I visualized Gods-dog and even she sports a nice tan. “Being of the Sun” was written 25 years before Sun of gOd. This beautiful book by Alicia Bay Laurel and Ramon Sender taps into the same spirit. Inspirational! All lovingly hand-written and illustrated. “After an initial delightful rush into it, I have now finally got to the end of your incredible testament, Being of the Sun. Sorry it took so long, but maybe I was waiting for the Summer to kick in. I’m just amazed at how tuned in you two lovers were, and to what a depth, all those years ago! Thinking that perhaps those sacraments and the light of our Sun gave a helpful and loving hand. It is at once a beautiful spiritual work of art and a practical guide to living a good life – a fitting accolade to the true light of all our lives. “Living On The Earth” (Viviendo en la Tierra) es una guía o manual para la vida sostenible, comunal y alternativa creada por Alicia Bay Laurel en el rancho-comuna Wheeler, en el norte de California, a finales de los años sesenta. Fue un éxito de ventas a principios de la década siguiente, y sin ser un libro de cocina, fue incluido en un prestigioso recopilatorio como uno de los 100 libros de cocina más influyentes de la historia de los EEUU. Está traducido al japonés y desde que el año pasado Kachina Ediciones se lanzara a editarlo en español, manteniendo los dibujos originales, podemos tener esta verdadera obra de arte en nuestra biblioteca. Pocos años después de su publicación, Alicia viajó con Ramon Sender a Colombia para investigar a fondo los cultos solares y en 1973 publicaron juntos otra maravilla: “Being Of The Sun” (Ser del Sol), una especie de manual para crear tu propia religión y vivir de una forma más consciente con la naturaleza. Está construido como un diario, e incluye las partituras y los cánticos asociados a diferentes rituales. No tuvo el mismo éxito que su predecesor, y la revista Rolling Stone llegó a catalogarlo como “el peor regalo que puedes hacer estas navidades”. A nosotros nos parece sin embargo, además de una obra de arte, un documento histórico de gran valor. Muy recientemente hemos conocido la fantástica noticia de que Kachina Ediciones se va a encargar de su edición en español para el próximo verano. That Yellow book [“living on the earth’] I can’t find it now. The next, “being with the sun” is now on hand. I liked Laurel’s leaf, and it was written that I put this name on it. It was a book that was always whispered and whispered to the truth. Singer-songwriter Keiko Ao Aqua Jimbo and her best friend, Sen, love Being of the Sun! Posted on June 18, 2006 by Alicia Bay Laurel	in Books. Most people who know my name associate it with my book Living on the Earth, which has been published four times in English, once in Japanese and once in Korean (2004). The Japanese edition has been in print continuously since 1972. First edition, The Bookworks, Berkeley, 1970. Only 10,000 copies printed, all sold within three weeks of publication. Second edition, Vintage Books/Random House, 1971. This was the first paperback ever on the New York Times Bestseller list, selling over 350,000 copies before going out of print in 1980. 4th Edition (Gibbs Smith, Publisher, 2003) with its distinctive metallic gold embossed sun on the cover, and 100% post consumer waste recycled paper and soy-based ink throughout. 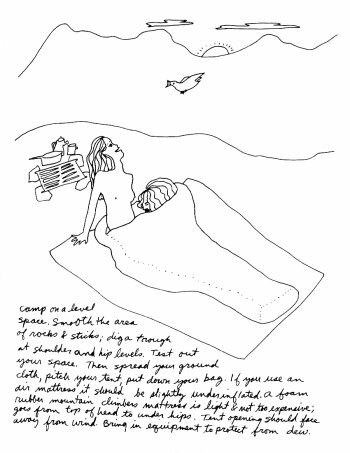 With simple line drawings and handwriting, and a groundbreaking layout, Living On The Earth captured the spirit of a generation and vast audiences. Widely imitated to this day, Living On The Earth changed the way books are conceived, and influenced countless artists and graphic designers. You can order either the 30th anniversary edition (2000) for $15, or the 4th Edition (2003) for $19 from me on this site. Be sure to specify to whom youÂ’d like it inscribed. I always add a little illustration, too. Shipping and handling within the USA is $5. Featured in the Utopia Then and Now exhibit at the Sonoma County Museum in spring of 2002. The topic is how to grow your own religion; itÂ’s a spiritual companion volume to Living On The Earth. Lots of color illustrations, music, and ceremonial suggestions. 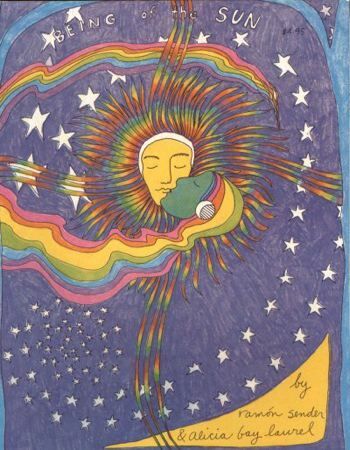 Poetic astrological calendar with large colorful drawings. Sorry, these are out of print, but I am looking into releasing them in print on demand editions. 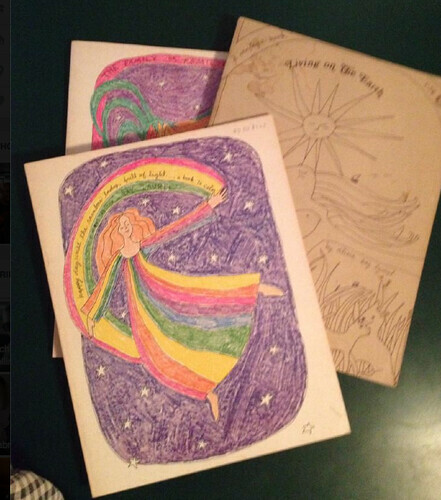 Lots of AliciaÂ’s crayon and ink drawings, with ceremonies and poems for lifeÂ’s passages by Joe Pintauro, who has since gone on to become a novelist and playwright of reknown. 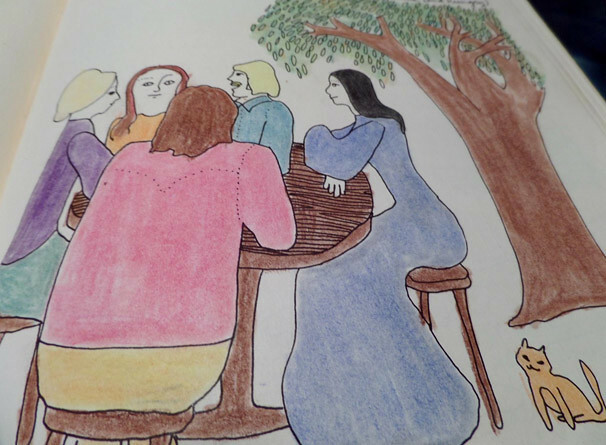 Wonderful recipes, stories, art and poetry by the folks who once ran the Liberation News Service and then created four communes in New England. Other illustrators include Peter Gould and Doug Parker. Script of a 1976 multi-media production on Maui, depicting the battle of developers versus environmentalists. My color cover and pen and ink drawings throughout. Posted on November 4, 2005 by Alicia Bay Laurel	in Books and tagged 4th edition. Gibbs Smith, Publisher is proud to release the classic best-selling guide to alternative country life, Living on the Earth. Entirely handwritten in the author’s script and illustrated with her line drawings, it is a practical home reference volume. And the information is relentless-organic gardening, outdoor cooking, crafts, herbology, midwifery, backpacking, survival, first aid, making and playing musical instruments, sewing, pattern drafting, building a kiln, a kayak, an ice chest, making candles, soap, ink, beaded curtains, ice cream, tamales, and, at the end, how to cremate. A list of useful-and magical-books, and addresses for hard to find tools and materials completes the appendices, along with a star map and an old English poem to the moon. Originally published in 1970, Living on the Earth is about permaculture, sustainability, simplicity and environmentalism–words that came into our vocabulary ten to twenty years later. Most of the projects involve recycling–stoves and flotation devices from 55 gallon drums, individual greenhouses from glass jugs, patchwork skirts from neckties. It’s about withdrawing from consumerism and finding true happiness through creativity, respectful interactions with nature, appreciation of other people, and consciousness of the Divine. It is a spiritual book that uplifts and instructs largely through the illustrations of people living outdoors serenely and vigorously. The message of the front cover illustration–ecstatic union with the natural world–resonates with people because it is our birthright. Living on the Earth was and is a freedom call to people in all parts of society—yes, it IS possible to find a simpler and more satisfying life outside of the industrial-military complex. Yes, it is possible to live in a world of innocent, smiling nudes, surrounded by things you grew, found or made yourself. Living on the Earth is also a historical document, an insider’s view of the communes of the late 60’s, today widely used in university history courses. Along with Ram Dass’s Be Here Now and The Whole Earth Catalog, it bespoke the joyous upwelling of global stewardship, trusting comradery, and direct communion with the Universal Spirit that marked the era’s sudden and enormous counterculture. Living on the Earth is a milestone in twentieth century art. 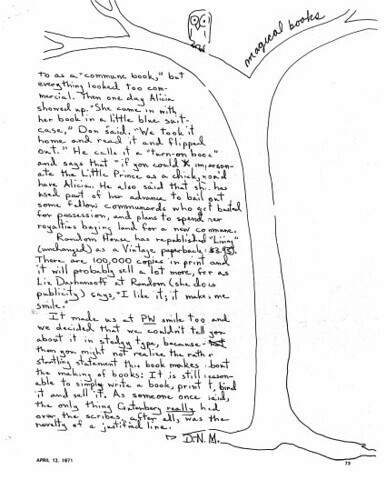 (Publishers Weekly took note immediately with a handwritten two-page review surrounded by Alicia’s drawings.) Within months after Living on the Earth was first published, dozens of new books and commercial art (packaging, advertising, giftware designs and greeting cards) based on its design and illustrations began to appear. Its influence is still clearly evident three decades later. 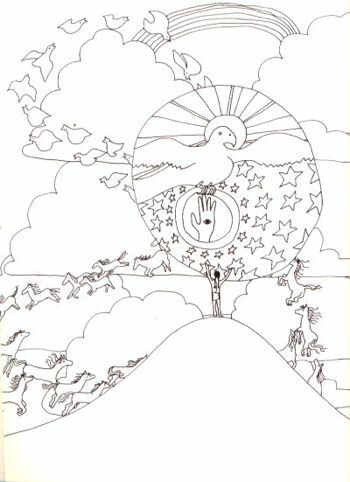 Living on the Earth was written, illustrated and designed by a teenager. As such, it speaks to young people as one of their own, daring them to create books, live adventurously, learn the sources of things they take for granted, follow their dreams. Alternative schools (where drawings of smiling nudes are not forbidden) happily use the book as a craft project book for students. The Gibbs Smith Fourth Edition of Living on the Earth is beautifully produced on recycled paper with soy-based inks, true to the publisher’s tradition for quality books and the author’s vision of sustainability. No left turn unstoned ! Amazing to think that she was a teenager when she began writing this “Bible” of natural living. Not only does it still hold up after 30+ years…but it makes even more sense now in the 21st century. I would give it to my children or grandparents with equal enthusiasm. Alicia Bay gets the ultimate hippie chick award! Assigned to give Alicia Bay Laurel’s “Living on the Earth” for the New York Times Book Review in 1971, I gave it a rave. It really defined the best of our generation’s nascent take on world consciousness. More than 30 years later, I’m still raving about it as ABL deftly connects today’s Earthlife with the one we imagined as kids. It seems to me that there are two kind of non-fiction books. Those that are tightly focused on their subject. And those that are wide-flung, giving a little bit of information about a lot of things that all come together as a cohesive whole. If that second type of book is done just right, you have a book that whets your appetite. It inspires research, and learning more, and figuring things out on your own. Living on the Earth, by Alicia Bay Laurel, is that second kind of book. In spades. Reading it makes me happy. It starts with a description of clouds, and ends with a drawing of the constellations in the Northern Hemisphere. And in between is a wealth of handwritten, gorgeously illustrated muse-inspiring ideas. See? That’s just a tiny bit of what’s inside this book. None of it is comprehensive knowledge, but all of it makes you want to know more. The original book was written in the 1970s, but a revision was done in 2000 so there are viable resources included to facilitate what I promise will be an insatiable desire to Google. This book was written in a time that, looking back, seems incredibly innocent. People, Babyboomers, broke out and did things differently–vastly differently–than their parents had. Self-sufficiency, doing things for yourself, seems like such a detour from the 1950s image of self-cleaning kitchens and TV dinners doesn’t it? Things are different today. In 1970 there was a push for the kind of back-to-the-land self-sufficiency this book so beautifully describes. But the resources were still there. Gas was still as cheap as tap water, and hardly anyone had even considered that we might run out of oil some time. No one, outside of perhaps some geologists or weather experts, was thinking about Climate Change in 1970. Maybe that’s why it was easy for the Babyboomers to become Yuppies? Their movement was glorious. But it wasn’t necessary. Self-sufficiency is necessary today. It is becoming more and more necessary with each passing year. There is a lot of talk about a need to regain skills that people had during the Great Depression. Of course there is; our economy is that scary. But there is something to be said for examining the brief and shining time in our history when people chose self-sufficiency. When figuring out how to do things on your own was a choice, not a necessity. How much easier is change when it’s a choice, not a mandate? Take it from someone whose life’s work has been with a population that is infamously resistant to change (teenagers, drug addicts…), self-inspired paradigm shifts are a beautiful thing. And this book–with its lovely, loopy handwriting and Adam-and-Eve illustrations, is an inspiration to a paradigm shift. After waking very early this very morning, I started to read Living on the Earth and was halfway through by breakfast. While I had considered a hand-lettered book to be more difficult to read, I could not have been more wrong. The hand lettering brought a sense of comfort and the contents reminded me of my childhood in Africa. If you lived in a rural area during the 60s and 70s, many of the items in this book will be very familiar. If you love handwritten letters from friends, then this book will quickly find a place in your heart. So, there I was stirring a 5-grain oatmeal mixture for breakfast and I looked down and caught a glimpse of my painted toes reflecting in the glass oven door. Suddenly I was transported to the years of my childhood where we build our own tree houses, watched carrots grow, milked cows, raised chickens, learned how to sew, experienced tick bite fever and snacked on friendship cake while walking barefoot on the warm earth. Living on the Earth is an enchanting read filled with lyricism and whimsy. It is written in a spontaneous style and the topics range from soap making to building rocking cradles out of barrels. 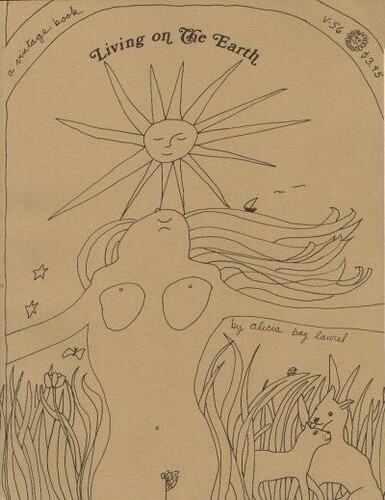 Alicia Bay Laurel has illustrated the entire book and it is a completely personal experience. Some of the highlights include backpacking tips, making hammocks with macramÃ©, making your own soaps, sewing peasant blouses, making your own moccasins, and building a kiln for making pottery. There is also information on how to make candles, bamboo flutes, bean bags, clothing, rose petal jam, organic diet soda, vanilla extract, dried fruits, nut butters, ice cream, sunflower milk, miso, roasted soy beans, smoked fish, bread, beef jerky, sour dough starter, steamed acorns, plum pudding and herbal tinctures. As I sit here with my lovely cozy heated blanket and fluffy slippers I can dream about living out in the wild as my washing machine swishes about with the Seventh Generation laundry soap I recently found at a health food store. This book has many ideas you can incorporate into your normal home life. You don’t have to live in a commune to enjoy the information about essential oils, nature-inspired products or environmental issues. The author recommends things like hemp paper and explores the many uses of apple cider vinegar and pumpkin seeds. To say the least, I was intrigued. This is definitely a must-read book for everyone interested in natural remedies. There are recipes for making herbal tinctures and you may find yourself looking for “myrrh.” If you love to cook you may be intrigued by the recipe for Plum Pudding. Alicia Bay Laurel is writing a modern sequel for the global family. “Still Living on the Earth” will be published in 2020. This book was updated in 1999 and is filled with useful addresses and websites. I loved the list of “more books that are still valuable 30 years later!” A helpful index completes this fun guide to living on the earth. I loved reading this book! While reading you may find yourself becoming nostalgic, enthusiastic about hiking or even making lists to buy a variety of herbs. What an amazing book. I found it at a used book store a few years ago. 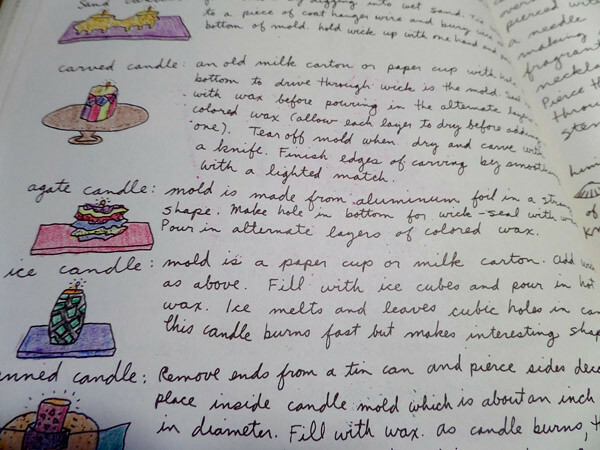 The line drawings are beautiful,and the recipes and crafts on each page are easy to make. This book makes me want to go live in a cabin out in the middle of nowhere every time i read it! It’s a definite YES for anyone who is into making their own “stuff”. i found this book as a young teenager up on a shelf. it was my mother’s, left over from HER hippie days. i took up the reading as well as practicing of the book and have become a better person for it. this book should be read by all. it is so simple and yet beautiful and eloquent. i highly recommend it. When we depend less on industrially produced consumer goods, we can live in quiet places. Our bodies become vigorous; we discover the serenity of living with the rhythms of the earth. We cease oppressing one another. Oppression hasn’t quite disappeared in the 30 years since Alicia Bay Laurel wrote these words, but, thanks to the enduring legacy of the back-to-the-land movement and the possibilities of telecommuting alike, more and more people are living in the “quiet places” Laurel celebrates. Living on the Earth was a well-worn (and bestselling) bible for the urban hipsters who fled the city and took up such pursuits as organic farming and leather tanning in the early 1970s; its author, a musician and artist who now makes her home in Hawaii, made their acclimation to country life just a little bit easier with her user-friendly instructions on such matters as how to keep gophers from invading the veggie patch and how to get rid of those nasty lice that once served as the mascots of bohemian existence. Lice or no, the countryside still has its undeniable charms. 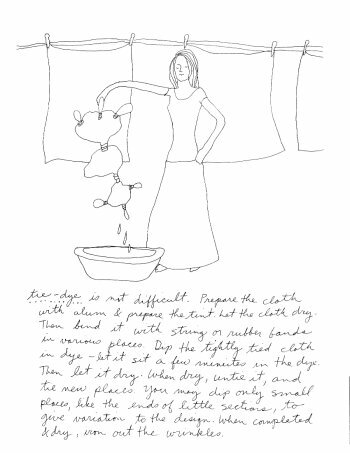 The reissue of Laurel’s handwritten, simply illustrated manual will appeal to anyone contemplating a new life beyond the city–or merely seeking pointers on how to simplify daily life. Things have changed, of course, since Laurel first self-published her zeitgeist-drenched book in 1970. Where the original edition had seed-to-bud instructions for growing marijuana, the reissue now comes with a modest disclaimer in which Laurel admits to having lost her taste for the stuff decades ago–but it also comes with a ringing endorsement for the use of hemp fiber and paper as a planet-friendly measure of economy. Laurel also juxtaposes her folk remedies for common ailments with a friendly reminder to head to the doctor if the pain is really bad, the kind of advice once shunned by the proudly self-sufficient barefoot medics, manuals in hand. Still, though updated here and there, Living on the Earth retains its recipes for everything from making Moroccan djellabas to molding scented candles to delivering a baby in the privacy of one’s tipi, all good things to know. Last year when I was about to depart for the Big Island of Hawaii, my buddy Kim asked me if I wanted to look up her friend Alicia Bay Laurel while I was there. “The Alicia Bay Laurel who wrote, Living On The Earth?” I asked, and yanked the book immediately out of the bookshelf to show her.Needless to say, I made the connection and spent a very pleasant afternoon with her. L.A. native and (according to the New York Times) “Martha Stewart of the hippie era” Alicia Bay Laurel is coming out with a 30th anniversary edition of her best-known book, Living On The Earth. I picked up a copy of Living On The Earth in the late ’70s and it immediately became one of my “desert island ” books. With chapters addressing such issues as how to grow potatoes in barrels while living in a van, Tibetan eye-strengthening exercises, keeping food cool without refrigeration, and alternative guitar tunings, it was a compendium of folk-life skills simply presented.Alicia grew up in Hancock Park. Her mother, a ceramicist, exposed her to artistic and cultural events, and as a teenager she did page layouts at the L.A. Free Press. She also attended the Otis Art Institute on a PTA scholarship. She subsequently attended San Francisco’s Pacific Fashion Institute.Alicia started writing Living On The Earth in 1969 when she was 19 while living on the Wheeler Ranch commune in Sonoma County. It was her third hand-lettered and illustrated book, but the first to be published. She had originally conceived of it as a pamphlet to help ease the transition of urban and suburban youth to their new lifestyle, but it grew into a manual. When it was published in 1971 and included in Stewart Brand’s Whole Earth Catalog it became a best-seller . The handwritten text and exuberant line-drawn illustrations were comforting and personal, and reflected the back-to-the-land aesthetic espoused by the youthful idealists of the era. This aesthetic was picked up and utilized by the creators of The Massage Book (1972), Woodstock Craftsman’s Manual (1972), The Vegetarian Epicure (1972), and later The Moosewood Cookbook (1977) and the works of Sark (1991 and forward).Alicia collaborated with her husband Ramon Sender on Being Of The Sun, a companion volume to Living on The Earth, published in 1973. This second volume is even more exuberant than the first, addressing aspects of meditation, celebration of the year, making music, and being passionate about life. They include instructions for making a bamboo root oboe and a set of bagpipes (from a plastic bag, masking tape, cardboard, bamboo and oat-straw whistles). They also composed 21 songs and chants for celebrating rain, night, time, welcome and other occasions. A few of these songs are on her CD, Music From Living On The Earth . Alicia had been playing fingerpicking folk guitar as a teenager, and learned of the joys of open tunings from her cousin’s husband, the well-known guitarist John Fahey. For the last 28 years or so, Alicia has been living in Hawaii (the first 25 in Maui, the last 3 on the Big Island). Her CD, Living in Hawaii Style, is more informed by the Hawaiian slack-key style of guitar playing. 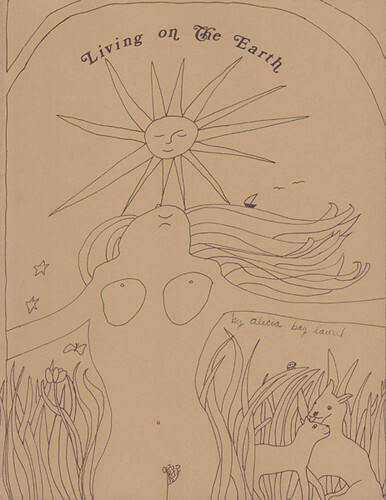 My forgotten copy of the handwritten, hand-illustrated 1970 sensation by Alicia Bay Laurel (not her real last name, but her favorite kind of tree) was gifted in the early ’80s by an old friend who really was a hippie. (My friend sewed pink and turquoise satin cowboy shirts for Country Joe and the Fish in the Woodstock era and took orange sunshine every day for a year.) By 1980, the peace-and-love hippie era was laughable, having transitioned into the apocalypse-readying New Age movement that was growing under the radical tutelage of bibles such as “Survival Into the 21st Century” by Viktoras Kulvinskas (published in 1975 in a similar style adorned by simple drawings). Then and now, Bay Laurel’s enduring “Living on the Earth” smartly serves as a sweeping encyclopedia of do-it-yourself instructions for simple, quiet living, removed from urban chaos — all in her own handwriting. It is timeless. The amount of practical and concise information is staggering. There are straightforward how-to entries on making an outdoor latrine, a solar oven, tire-tread sandals and a guitar. There’s herbal everything, with recipes for healing shampoos, poultices and soups. (In her revised entry on hemp, Bay Laurel does offer the disclaimer that she hasn’t inhaled since the ’70s but is in favor of hemp as a viable commodity.) Medical advice covers the gamut, from how to bind blisters on a backpacking misadventure to how to birth a baby (with an illustration of a baby oozing out of a hairy triangle). When Alicia Bay Laurel began writing “Living on the Earth” in 1969, she was a teenager on a California commune. Now in her 50s and living in Puna, she has since made a name for herself in other wide – ranging fields, from wedding planner to Hawaiian/folk musician. But “Living on the Earth,” a manual on simple living that contains everything from recipes for pickles to tips on home childbirth, has gone on to live a life of its own. Revived by Random House a few years ago with a 30th Anniversary Edition, it was re – issued last month in a new fourth edition under a new publisher, Gibbs Smith. Laurel will be making three appearances on the Big Island next month to promote the new edition. On Thursday, Dec. 11, at Borders Books and Music in Hilo, she’ll be singing music from her CD, “Songs from Living on the Earth,” and telling stories about the book’s four incarnations and how they came about. She’ll repeat the performance at 6 p.m. Dec. 12 at Taro Patch Gifts in Honokaa. On at 3:30 p.m. Dec. 14, a $5 donation will admit guests to a longer music and story – telling session at Volcano Garden Arts on Old Volcano Highway in Volcano. “Living on the Earth” was a revolutionary book, in more ways than one. Not only did it become a bible for the commune movement, it also sparked a small publishing revolution. Ironically, a cookbook helped keep “Living on the Earth” alive. While on a promotional tour on the mainland, Laurel met the editors of a cookbook that was being put out by the Esalen Institute. They recruited her to illustrate the new book, and introduced her to the Gibbs Smith of Gibbs Smith Publishing, who turned out to be a fan of her first book. “I told him, ‘Funny you should mention that. I just got the rights back from Random House,'” said Laurel. Smith bought the rights to produce a new edition, and set Laurel to work on a sequel called “Still Living on the Earth: a Dictionary of Sustainable Means,” with updated information on such topics as permaculture and sustainable lifestyles. With Smith, she recently attended the annual Bioneers Conference in Marin County, California to gather information for the book, which is due out next year. “That is the largest world conference on sustainability. By going there, I really got an idea of the breadth and depth of what’s going on in this movement,” she says. The term “sustainability” covers a huge range of topics, from recycling to producing biodiesel fuels to “permaculture” – low energy agriculture systems that don’t require constant cultivation and massive amounts of fertilizer. All are aimed at producing a society that can sustain itself without using up huge amounts of fossil fuel and other non – renewable resources. The movement is an outgrowth of the “back to the land” communes that inspired, and were inspired by, Laurel’s original book. The new edition of “Living on the Earth” includes a forward by Prof. Tim Miller of the University of Kansas. Miller, a leading expert on the history of communal movements from early American religious communes to the present, helps to put the book in the context of its times. The hard – to – classify volume – it’s been catalogued under headings ranging from “spirituality” to “home reference” – has also become a historical document. But whatever else “Living on the Earth” is, it remains a font of practical advice for ordinary people – especially this time of year, when the book’s multitude of craft instructions could produce some unique gifts. There are also plenty of house and garden tips. The gardening section, for instance, lists the amount of seed or plants needed per 100 – foot row to plant any of 18 different garden crops, and gives solid advice on such topics as irrigation composting and mulching. There are sections on canning and jelly – making, with recipes for traditional treats such as apple butter and exotic flavor sensations such as rose petal jam. There are directions for making home – brewed beverages such as apple mead and elder blow wine. There are directions for salting fish and for making yogurt and sauerkraut. There are also recipes for making soap, varnish, glue, shoe polish (“equal parts oil, vinegar and molasses. Add enough lamp black to form a paste”), paint remover (“1 part turpentine to 2 parts ammonia)” and waterproofing for cloth and leather. Volcano and Kaumana City residents may be particularly interested in Laurel’s directions on how to clean a wood stove and prevent it from rusting. And there is lots of information that is just plain interesting. Thirty-one years ago, a 19-year-old urban refugee sat down to write a simple how-to pamphlet for new members of the rural California commune where she landed after sticking out her thumb. 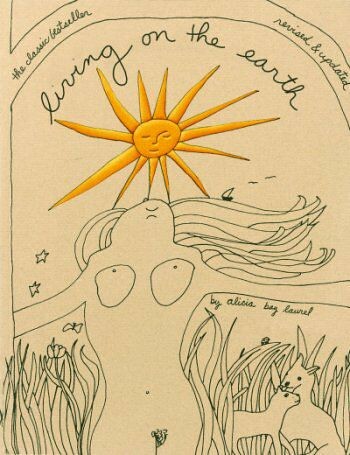 The resulting book, “living on the earth” quickly became a cult classic that catapulted its author, alicia bay laurel, to the top of the New York Times best seller list and sold more than 350,000 copies. Much more than a manual for making eggplant tooth powder, macrame bags and domes, the book became a counterculture bible that inspired countless back-to-the-landers. The author’s simple line drawings and distinctive handwriting, complete with misspellings, gave the book a homegrown integrity that struck an instant chord with a generation ready to reject big American cars, Formica and Wonderbread. “living on the earth” was part Boy Scout manual, part Betty Crocker cookbook for a generation desperate for the beat of a drummer that did not lead to Vietnam. The book talked about having babies at home, dying and just about everything in between. Thursday, the author, now 51, will read, sing and sign copies of a newly-revised edition of the book at Gateways Books in Santa Cruz. She decided that this new generation might need the book too. It took a while to convince publishers. The stop in Santa Cruz is part of a unique eight-month road tour sheÂ’s making through the U.S. bay laurel is doing her tour in typical alternative fashion: she went through her address book and asked all of her far-flung friends if she could stay at their houses for three days. Then she called the bookstores in their areas to set up readings. No, she won’t be arriving in a VW van. She’s borrowed her 80-something mom’s indigo-blue Peugeot station wagon for what she calls a “connect-the-dots” tour. 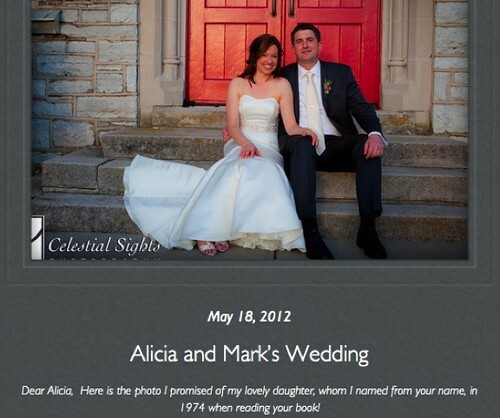 You follow alicia’s adventures via the daily entries she makes on her website, (www.aliciabaylaurel.com). alicia! Girl, what’s gotten into you? Well, the world and alicia and all of us have changed in 30 years. But the many things she’s done since her 2½ years living at Wheeler Ranch, a northern California commune have left their imprint. Her distinctive style was widely imitated. That may be the sincerest form of flattery, but it doesn’t pay the bills. When she turned down an ad agency’s request to draw a tequila ad, for example, she said another artist changed her name to a similar-sounding one and did the work. Since 1974, bay laurel has lived on Maui, Hawaii. There she’s been an artist and illustrator, singer and guitarist and yoga teacher. In 1988 she started a destination wedding business on Maui. It was so successful it earned her spots on Good Morning America and in “Bridal Style” book. She sold the business a year ago, at about the same time Random House asked to reprint the book. Friends helped her revise it, and the new version reflects updated ideas about health, ecology and so forth — she no longer uses pot, for example, but supports its use for fiber — but there is no mention of computers. The tour has another fascinating twist on the old days of hippie road trips. Once she’s finished, she plans to take her “living n the road” computer entries and turn them into, what else, another guide for another generation. Meanwhile, she hasn’t lost her affection for the naive teen-ager she was, the one she thinks of as a daughter in some ways, the one who still influences her life today. But right now, she’s on the road. Right now, her stuff is in storage and she’s got her metaphorical thumb out there for new adventures. From Talking Leaves Magazine, Summer/Fall 2000The first thing I noticed about this book was its delightful homegrown look, the handwritten pages and playful line-drawings illustrating the text on every page. Living on the Earth, originally published in 1970, is a true heirloom. It is reminiscent of the era of hippies and the back to the land movement, but it is essentially a collection of recipes for living on the earth suitable for any day and age. It includes how to do everything you’ve wanted to know how to do for years but didn’t know how, or didn’t know whom to ask, or didn’t have time to read an entire volume on the subject, or lost your library card, or didn’t even know you wanted to or could do until you read this book. People can do that? Yep, get ready! Granted, these aren’t science experiments, but real live descriptions telling how to live a happy, wholesome life where you are empowered individually to take care of your needs and to be self-reliant and resourceful, as many of our ancestors before the technological revolution were. You don’t have to be a full-on Luddite to enjoy this book, though, and you certainly don’t have to live in the country. There is something for everybody. Ever wonder how to make yogurt? Or miso? How to get rid of ants? Make your own shoes? Build a yurt? Or how about make candles, flutes, pemmican sausage, jerked meat, soap, bread, and country pie? Not only is this book astoundingly complete and deliciously inspiring, but I could tell something about the author as well. She is a collector. She collects ideas about things that work for living, for being human, and relying on human powered innovations; for, as titled, living on the earth. She is a human and a teacher. Wow, she must have collected for years! No wonder this is a revised edition. I think it would be nearly impossible for a collector of valuable information to publish only one edition of such a book. Living on the Earth is written clearly, concisely, and in a positive manner. Read this book and pass it on! Hopefully you’ll learn something new, and then teach a friend to do something too! 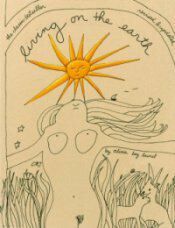 “Living” was a handwritten, hand-illustrated tome that led a legion of people to ditch unfulfilling careers in favor of simpler, more meaningful work and earth-conscious lifestyles. The book made the New York Times bestseller list and was reviewed favorably by Time, Look and numerous other magazines. More than 350,000 copies were sold over 10 years, which allowed Laurel, at age 21, to continue a carefree existence until she turned 30. That’s when the hippie became a musician, photographer and eventually, businesswoman. Now 51, she’s aware of the rap heaped upon her generation, often regarded as hypocrites who turned on, tuned in and sold out. But that characterization is unfair, she said. Once a hippie, always a hippie. The Internet piece she is talking about is her Web site, www.aliciabaylaurel.com, where she keeps a diary of her adventures in text and photos. Until recently, Laurel called Kihei, Maui, home. That’s where she was running her business, “A Wedding Made in Paradise” — helping tourists plan their weddings — for 11 years ending in July 1999 when Random House purchased the rights to republish “Living on the Earth” on its 30th anniversary. She’s now on a national tour to promote the book. He told Laurel he was 8 when his babysitter gave him a copy of the book. The ideas in it led him to Berkeley and UC-Davis, where he studied sustainable technology and conservation. He became an organic farmer and agricultural inspector who founded the Hawaii Organic Farmers Association. “We didn’t know how to live on the land,” she said. “As a service to the community, I thought I’d put together a handbook for the new people detailing how to build a fire, how to build an outdoor kitchen, how to make soap. And I had information of my own to share. I had gone to dress-design school and learned pattern drafting so I could explain how to sew a simple tunic. My mother was a ceramic artist so I knew about clays and kilns. Laurel got in contact with Random House, which published 10,000 copies of “Living on the Earth.” The copies sold out in two weeks. “It was not like I wanted to prove anything, like tell people how they should live. 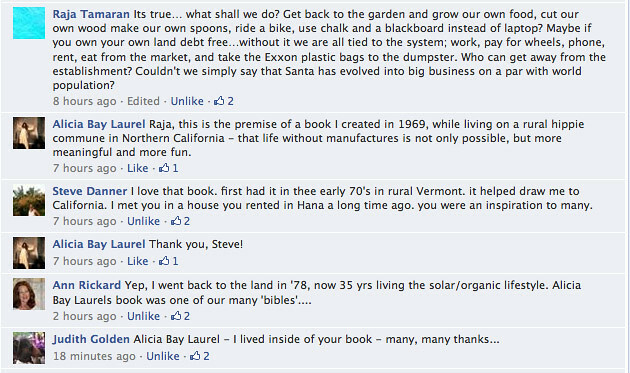 As it turned out, many people were inspired by my book to go live on the land. “You never know what’s going to come from following your dream. You might end up broke and miserable, or you might find something far greater than you ever imagined. Not all hippies were so lucky. Many returned to the mainstream and the corporation, in the process seeming to become the kind of creature they had run from. “What changed was the people in my age group began to have babies,” said Laurel, “Raising a child meant they needed a steady income, a home, because a child may not want to participate in a lifestyle that meant going without shoes, the latest clothes, videos, all that stuff. This may explain the increasing population of bohemians, who, according to Laurel’s definition, possess three characteristics: “They strongly believe in compassion, more than profit. Creative self-expression is more important to them than conformity. They believe a relationship between the physical and metaphysical is important. “If these beliefs guide their decisions in life, that person is bohemian,” Laurel said. Another name for them is “cultural creatives” and according to a new book, “The Cultural Creatives: How 50 Million People are Changing the World” (Harmony Books, $25), by marketing experts Sherry Ruth Anderson and Paul Ray, they account for a quarter of the United States population. And their ranks may be growing. “I have a friend who runs the Web site hippy.com, and 85 percent of the people who visit are between the ages of 14 and 29,” she said. The growth of technology has spurred an opposite trend focusing on tactile arts, including the current hippie trend in clothing. This is reflected in peasant-style garments and other natural-fiber clothing embellished with embroidery, beads and feathers. Yet, beware of those in hippie guise. Laurel says it’s more important to feel the part than look it. “The Anthropologie spring catalog is full of hippie clothes, but they’re expensive, like an $80 skirt and $200 sandals,” she said. “It’s the same kind of stuff I used to buy in thrift stores so it’s funny to me. Thirty years after its original publication, the newly revised and updated Living on the Earth remains the definitive guide for those interested in shucking off the trappings of modern life and running off to start a commune. Author Alicia Bay Laurel was just 20 when the first edition of Living on the Earth was published in 1970. One can just imagine the flowerchild she was sitting cross-legged in some verdant field with her sketchbook in her arms while she filled page after page in her growing compendium of modern knowledge for skills almost lost. Everything from milking a cow, making glue, soap and candles to building an interesting salad (“and some taste trips like kelp, onions, raisins…”), organic sauerkraut and sunflower milk. Really, the list of what is included is too long to even attempt. Suffice it to say that, if you were actually taking a run at community-building at the edge of a wilderness, Living on the Earth would be a pretty handy book to have around. Especially if you’d also brought your Champion juicer and some powdered potash along for the ride. The 2000 edition contains all of the homespun charm of the original. Nothing — from the copyright notices to the index — is typeset. Everything is in, presumably, Bay Laurel’s own clear and schoolteacherish hand. The author’s naively whimsical illustrations are intact, as well. 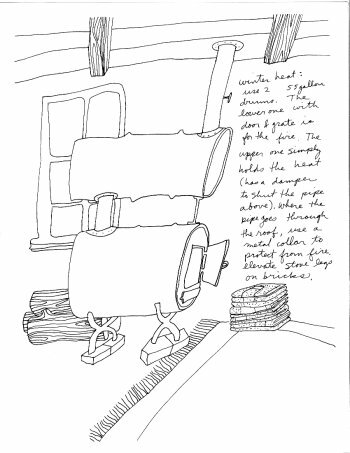 The author has included a sketch on nearly every page. In some cases, the illustration and the text form a sort of whole. For example, that sauerkraut recipe is written inside of the jar. There’s lots of utopian brouhaha going on, as well. Naked celebrants dancing under trees and playing the instruments they’ve just made. An unclothed man sprinkling water from a hose onto both a cavorting child and a line of willing plants. Eight unclothed and nearly unclothed workers joyfully tending their garden. A great deal of the book is given to the execution of simple tasks — and here again I’m tempted to make a list: tanning leather, curing a cold, remaking second-hand clothes. However, some of Living on the Earth deals with higher concerns. Bay Laurel tells us, for instance, that “hatha yoga keeps you stoned,” and that “the Chinese were once very hip to living in nature.” Despite all of this naively rendered and idealistic exuberance, Living on the Earth is an oddly complete book, one that would be useful to have at hand if you were, for example, stuck on a deserted island or lost in the woods. It also includes much that will interest modern vegans (aside from that leather tanning reference, of course) and others concerned with finding a more organic course through their lives. Linda Richards is editor of January Magazine. June 15, 2000A few years ago this book would have been another good book for your 1970’s collection of how things used to be. But, in just a couple of years, more and more people have begun looking for ways to simplify and regain the pleasures of being more actively involved in the creation of their own living space and lifestyle. 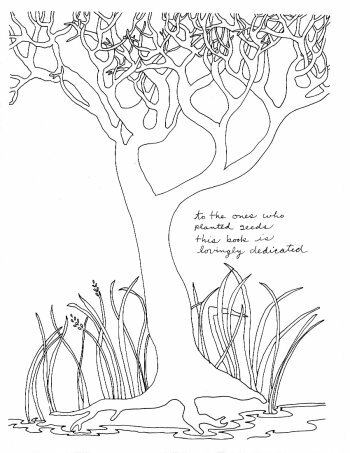 Living on the Earth is written in Alicia’s cursive script and illustrated on every page with her line drawings. Still containing most of the original text and drawings, she has updated this classic counter culture lifestyle book with information on sustainable technology, preservation of the environment and new natural food recipes. Alicia Bay Laurel is back. The trend-setting author who in the early 1970s encouraged thousands to go live in a yurt is in Sonoma County with a new edition of her counterculture classic, Living on the Earth. Years earlier, at 19, the Los Angeles native was motivated to pen a how-to handbook for hippies after moving to Wheeler Ranch in Occidental. The west county parcel, a former infamous hippie enclave, is owned by landscape painter Bill Wheeler. Indeed, Laurel’s best-selling tome is entwined with the history of the county’s idealistic back-to-the-land movement and the repeated efforts of county officials to destroy it during the late 1960s and early 1970s. I caught up with Laurel, now 51, in Graton, on tour to promote her book. She had loose, nut-brown hair framing a surprisingly youthful face and wore a denim skirt and a halter top of patchwork embroidered fabric. Laurel still sports a flower-child look. The free-ranging manual Laurel conjured includes step-by-step instructions for making sand candles (remember them? ), cooking on a woodstove, creating wind chimes out of tin cans and seashells, and birthing a babe at home. “How do you grow things? How do you make clothes from things out of the free box? These were things I needed to know, and I felt that other people would surely want to know them as well,” says Laurel. The unconventional set of instructions proved to be just what the reading public craved. Published in 1970 by Bookworks (an imprint of Oakland book distributor, Bookpeople), Living on the Earth enjoyed overnight success. In six weeks the first run of 10,000 copies disappeared off shelves. Then, two weeks before he died, Bennett Cerf, president of Random House, acquired the rights. In 1971, the Random House edition emerged as the quintessential bible for wannabe and would-be back-to-the-land types, selling some 350,000 copies in English and landing on the New York Times bestseller list. The original version still sells in Japan. Why the phenomenon? By 1971 the back-to-the-land movement was well under way and Laurel’s book resonated with those longing to move to the country. The large format softcover, written in Laurel’s loopy, cursive script, with few capital letters, broke the rules. 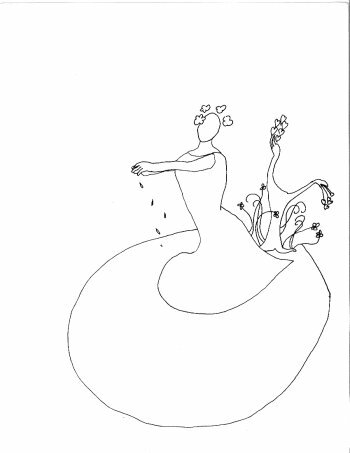 Simple line drawings cheerfully illustrate the text and included many pictures of men and women in various stages of dress and undress. The innovative book design was emulated by dozens of books including Anne Kent Rush’s The Massage Book and Mollie Katzen’s The Moosewood Cookbook. Just as surprising to the publishing industry, Laurel’s homage to the hippie homemaking was among the handful of paperbacks, including the Whole Earth Catalog, to outsell hardcover titles. Laurel stayed on Wheeler Ranch for two years. “I left to go on tour for the book. My impetus to leave was that we were being raided by a combination of the county health department, the housing department, and the vice squad. The big raid came only a few weeks after I threw a huge party to celebrate the publication of my book. There were 800 people including people from communes from all over California.” Recalling that hippie gathering, Laurel says, “Each group had a different campfire and music at night. (Actor) Peter Coyote’s group led owl totem chants. Coyote had three children named Big Owl, Owl, and Little Owl. I’m sure they have different names now,” she adds, laughing. An online memoir about the communal ranches recalls Laurel as a hardworking participant, generating “income from various creative projects which she sold, an activity then unique among Open Landers.” After she achieved success, “Alicia was very generous with her checkbook,” says Wheeler. Laurel created and published six more illustrated books after Living on the Earth. In 1974 Laurel visited Maui and decided to stay. There she worked as an underwater photographer, yoga teacher, book illustrator and teacher. In 1988 she opened a destination wedding business, selling it in 1999. “I wrote books while I was in Hawaii but nobody wanted to publish them.” Not long after selling the wedding business, Random House decided to re-issue Living on the Earth. With the help of experts, Laurel updated the 30th anniversary edition of Living on the Earth (Villard Books/Random House 2000; $16.95) with new information on sustainable technology and preservation of the environment and new recipes for natural foods basics. The directions for growing bean sprouts aren’t as “funky” as they were, but all the original drawings are there. “I was very careful not to put in new things that were out of character with the person I was then.” The result is a book that looks very much like the original, but the updated resource listings include Web site addresses. Traveling to readings in an old royal blue Peugeot, Laurel has met many who have said her book changed their lives. Several carried Living on the Earth around the world. One young woman was named after Laurel. “She was born in a teepee, of course,” says Laurel. During her sojourn in Sonoma County, Laurel plans to catch up with old friends and walk over the land at Wheeler Ranch, recording her impressions on her Web site. “The thing about the relationships that began in those days is that they’ve been extremely durable, almost like blood relatives,” says Laurel. “We are intertwined through our love of the land and through our creativity,” agrees Freestone author Salli Rasberry, whose first book was published shortly after Living on the Earth. “Those of us living in and out of the communes began experimenting in simple living, attempted to use all of our senses as we connected with the natural world. People like Lou (Gottlieb) and Bill (Wheeler) provided sanctuary and a time out to try and make sense of a world that made no sense to us,” adds Rasberry. Undoubtedly Laurel will find that the Occidental area reflects the integration of the rascals, artists, hippies, and greenies who moved to the established rural town some 30 years ago or more and stayed. Among them, Wheeler, who celebrated his 60th birthday on Saturday. Sara Peyton is an Occidetal free-lance writer. E-mail her at sarapeyton@pressdemo.com. Farming is certainly a paradigm of living with nature, as is gardening with a protective eye to the land itself. Rodale’s extensive list of gardening books has long stressed organic methods. In January, Bantam publishes Gardening for the Future of the Earth (A Seeds of Change Book) by Howard-Yana Shapiro and John Harrisson, and February will bring The Landscaping Revolution: Garden with Mother Nature, Not Against Her (NTC/Contemporary) by Andy Wasowski with Sally Wasowski. While some plant, others seek out plants, occasionally for health reasons. Medicine Quest: In Search of Nature’s Healing Secrets (Viking, Mar.) is Mark J. Plotkin’s look at botanical as well as animal cures. Living on the Earth (Villard, Apr.) by Alicia Bay Laurel includes herbs to treat stomach ailments; this title became a surprise hippie bestseller (300,000 copies sold) when it was originally published nearly 30 years ago. Nature’s Medicines: Plants That Heal (National Geographic Books, Apr. 2000) by Joel L. Swerdlow specifies and illustrates 100 of the most curative plants. Earth”, surprisingly became a New York Times bestseller. original drawings and most of the original text remain intact. page. This magical yet practical book will get lots of use. It was 1970, and people were dropping out in droves. Wood stoves were replacing electric heat, milk cartons were transforming wax into candles. Someone noted that more pottery was created during the “70s than during the history of mankind – perhaps an exaggeration. One of the gurus for back-to-the-landers 30 years ago was a woman who named herself Alicia Bay Laurel. Then 19, she lived on a California commune, and after collecting country lore, she hand wrote and illustrated a book, Living on the Earth. Now her hippie how-to book has been reissued so that once again it invites contemporary malcontents and vicarious readers to make almost everything from scratch. That means jerky from game you shoot yourself, soap from ingredients you stir for hours, patchwork quilts from upholstery samples and remnants. Nothing goes to waste in her world; everything yields to human ingenuity as long as there’s time enough to fiddle. Bay Laurel also doesn’t shrink from life’s inevitabilities. Her simple recipe for forest cremation: “Make a pyre of wood, lay the body on top, pour on kerosene and lots of incense. Burning bodies don’t smell so good.” Bay Laurel’s was the first paperback to out-sell hardcover books, says her publisher. It recalls a time when rural America was the destination for those seeking to create a life free of materialism and full of joy. If you didn’t live through that decade, no problem; Bay Laurel will still bathe you in nostalgia. Call it “That ’70s Book.” Originally published in 1970, it finally went out of print in 1980 after it sold more than 350,000 copies to folks on communes and to curious middle-class moms and dads in suburbia. 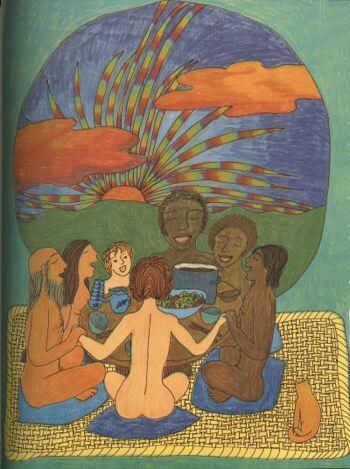 Living on the Earth, Alicia Bay Laurel’s hippie workbook, was just what city kids needed in the ’70s when they left home or dropped out of college, and moved to the countryside. 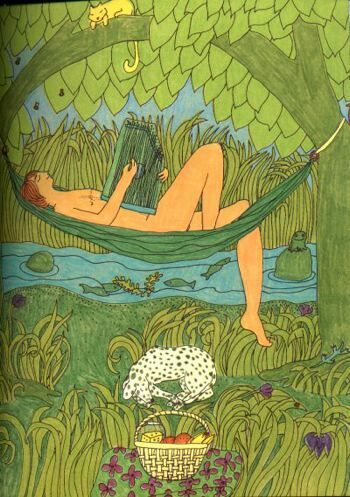 Written with a graceful hand and easy to read, it provided practical information about homesteading and farming, and offered beautiful drawings of naked girls and boys in an Edenic landscape-–all of which made the rigors of rural living look like fun. Now, with third-generation hippies quickly coming of age, Laurel’s book is back in print in a new, revised 30th-anniversary edition that’s more environmentally sensitive than the original. This time the author doesn’t suggest bathing in streams or cutting down trees in the forest to make human habitats. There are other changes here and there, but overall the joyous, down-to-earth feeling of the original book has been preserved. The values of the counterculture come through as loudly and clearly as ever before. It’s hard to believe, though, that Living on the Earth will sell as well in the coming decade as it did in the ’70s when it reflected the belief that paradise could be created here and now. Today, it seems in part like a cultural artifact from a long-ago decade. Still, Laurel’s book is undeniably charming and it’s likely to make unreconstructed hippies feel nostalgic for days gone by. For the utopians of the 21st century it’s likely to provide renewed inspiration to live in harmony with the planet and its creatures. The 30th anniversary edition of Living on the Earth maintains the innocence, lyricism and whimsy of the original, enriched with current information on sustainable technology and protection of the environment. At once a practical manual of recipes and directions for creating from scratch all of life’s basic amenities and some of its frivolities, an influential artist book with an instantly identifiable style, an insider’s view of the Utopian commune movement of the early 1970’s, and a spiritually uplifting lifestyle book, Living On the Earth is as charming today as it was 30 years ago. from: The Austin Chronicle, September, 2000It all seemed a lot simpler in 1971. The simple solution to my misery was to get back to nature and learn to grow my own food and weave my own fabric and live in a field with dozens of other dispossessed hippies, children, and dogs. Fortunately, that never really happened, and it chills me to realize how close I came to it. So when the reissued Living on the Earth landed in my hands, it was like I was trapped in a time machine in an old science fiction movie. Suddenly I was flailing helplessly against a big whirling spiral. In 1971, I was a mess — a confused adolescent trapped in the hell between hideous teenage persecution and suburban emptiness. And this book offered a way out. As if she were a cross between Martha Stewart and a Deadhead, the author presents a utopia of simple self-sufficiency with decidedly childlike illustrations, presumably to underscore the simplicity of simplifying your life. It’s not really all that easy, but, back then, this book made me dream of it. The first author I would like to introduce here is someone whose books have been on my shelf (and in my heart) since the early 70’s. As young back-to-the-land homesteaders headed for the idyllic country life, many books were needed to give us suburban transplants some sorely needed guidance. A number of us had never even seen a vegetable garden before!!! Let alone know how to can, freeze etc. without killing ourselves in the process!! And during that time, amidst all the other purely practical books..”Living on the Earth” was born. 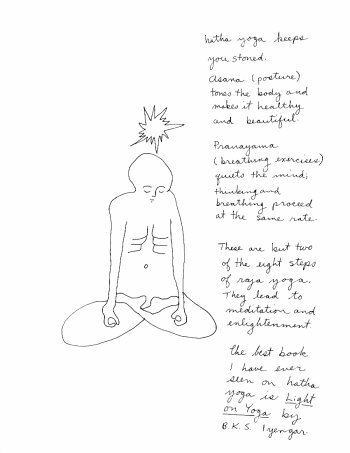 Hand-lettered and illustrated by Alicia, it was loaded with practical advice of all sorts in a wonderfully whimsical manner…weaving spirituality with earthiness. Her works have always been a reminder to stay true to my heart..and to retain simplicity in lifestyle, love for all and stay high naturally by being in love with life. OK, on to the final part of my economic rant. In addition to getting your own thing together, I think it is equally important that you want less. There are several books that I recommend. First, the classic. Walden. Second is a book on the practicalities of a Thoreauvian lifestyle in the present day, Alicia Bay Laurel’s “Living on the Earth”. The third book is somewhat deceptively titled “The Tightwad Gazette”, by Amy Daczyn (not at all sure about the spelling of that last name, pronounced “decision”) It is not about being ungenerous, rather it is about giving yourself a lifestyle of sane spending. Additionally, many of the ideas in this book are also environmentally beneficial. It is one of those nice situations in life where there is little tradeoff: If you are doing it for the environment, you also save money; if you do it to save money, you also save the environment. Not bad, huh? I’m not sure if we can ever cease craving, but our cravings do have to be calmed. In addition to all the practical suggestions in Alicia Bay Laurel’s book, she also suggests meditation. Try it. Unless enough of us calm our inner fires, we’re all doomed. 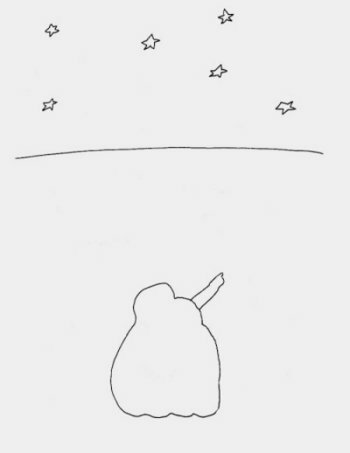 This book is illustrated by the author in simple line drawings. She draws knowledge about communal hippie living from many individuals and acknowledges them in her book. They give specific directions on how to build your own shelter, dig a proper latrine, grow your own food, sew your own clothing, and live harmoniously on the earth with your fellow humans. These lessons taught by Alicia Bay Laurel and her friends should become part of our American oral tradition. People of all generations can benefit from the author’s childlike perspective on simplicity. Back in print after 20 years, this homesteading primer presents a practical and fun design for life lived the natural way. Readers will learn how to construct an outdoor kitchen, practice midwifery, build a kayak, and make their own soap. A classic of the back-to-the-land, do-it-yourself philosophy of the 1960s, this free-spirited, homemade, information-packed book is updated with information on sustainable technology and the environment, while maintaining the freewheeling lyricism of the original 1970 edition. In drawings, recipes, and handwritten text the book depicts human life in ecstatic harmony with nature. It’s also a wide-ranging compendium of country living skills, in a design that influenced many books to follow, created by a then-teenaged resident of a northern Californian commune. Inspiration is not the word! When I heard your interview, I was so excited because you wrote your book exactly for people like me. I was a kid born in a small town in Texas who never really had to do anything! When I ran away from home and moved to a commune community, Living on the Earth was a great tool for providing an orientation on LIFE! I learned how to survive not only communal living but how to live on the earth! In the commune I used your basic whole wheat bread recipe and baked them in coffee cans so I could make 9 loaves at a time upright. I had to make 30 Sandwiches a day as well as breakfast and occasionally dinner. I made our community granola that they all LOVED! There was some controversy in the commune because I was a “guy” and should be doing the manual labor and not working in the kitchen. The women liked that I was cooking and everyone agreed that I was good in that arena. What I learned from Living on the Earth is that the secret to good cuisine is fresh products! It is hard to go wrong when you start with wholesome natural food. I even made some clothes after reading Living on the Earth. They were more like robes and baggy shirts but the point was that this kid with no knowledge was able to plant a garden, make clothes, cook on a campfire and a wood-stove, develop a Granola that is for sale today “Ezra’s Granola” and create a niche for myself in a community. I was 17 when I first picked up Living on the Earth and still have the original copy. I am 54 today and still read it and remember good times with Alicia! I would be honored and humbled to prepare dinner for you! Wheeler Ranch was founded by landscape artist Bill Wheeler on a 320-acre ranch along Coleman Valley Road. Wheeler opened the ranch to everyone after county authorities began rousting the residents at Morning Star Ranch. When Morning Star was leveled, Wheeler Ranch continued as a quintessential hippie commune until the bulldozers arrived in 1973. Wheeler Ranch was written up in the June 1970 issue of Harper’s. The book “Living on the Earth”, a best-seller in the early ’70s, was written while author, Alicia Bay Laurel, was living on the ranch. i got this recipe from a FABULOUS book, “living on the earth” by: alicia bay laurel. ~soak raw hulled sunflower seeds or almonds in water for 8 hours. Read Alicia Bay Laurel’s book “Living on the Earth” for more ideas on camp food. I consider this book to be the essence of hippiedom. Nevertheless, as folk literature—as the crazy quilt of a quarter-century’s worth of hints for rural living and as a monument to one woman’s determination to feed her seven children by ingenuity and hard work—this book should be shelved in your collection between the Foxfire books and Alicia Bay Laurel’s Living on the Earth . Stephanie, age 17: Well, I know a book you could refer to. I have this book called Living on Earth by Alicia Bay Laurel and it is pretty much a guide to life. It explains methods to make just about everything yourself so that it is healthy and environmentally friendly, and more often than not, vegan or vegetarian. The book includes beauty products, like soaps (facial), different types of baths (Japanese, steam, etc.) and a bunch of other things. You should get this book – it’s amazingly helpful, unique and extremely interesting. A “how to” guide to suit your everday needs. We were graced with two fabulous performers this week, who stopped here on their way across country. Alicia Bay Laurel wrote a best-selling book called Living on the Earth in the late sixties based on the skills she learned living on a commune. She just rereleased the book and is traveling the country telling stories and singing songs about that time. She performed here because Alline contacted her about selling her book through Community Bookshelf, Alline’s book business. Living on the Earth When I first met Bella, I saw this book on her bedroom wall and knew we’d have the same goals in life. (I also had a copy!) It’s the original hippie guide to homesteading. It’s a great book to color in the pages with your kids – there are big, childlike, sweeping illustrations. No printing…everything is just handwritten in Alicia’s loopy cursive. This book starts with outdoor survival and moves to important things like home birth and home medical remedies, how to make your own shellac and turpentine, dealing with crabs and lice. Also fun things that only the hippies would think of – tie-dyeing with natural dyes, making musical instruments, wind chimes, and kid toys out of recyclable materials, etc. Will bring a smile to your face, and your kids will love it. It’s another one that is probably out of print and you’ll have to look hard to find a copy. I was so impressed with your first edition that I’m sure my daughter will love the 4th edition. The information you have captured is getting lost in our current culture and the way you have detailed such valuable knowledge is so wonderfully straightforward, useful and inspiring. My husband and I currently live aboard a small sailboat that is almost completely self-sustaining, and little by little we are trying to return to a simpler, more natural way of life while we cruise around the world. I will use your book as a guide toward this end, and I’m sure my daughter will be just as inspired. Thank you and Fair Winds and Following Seas to You! 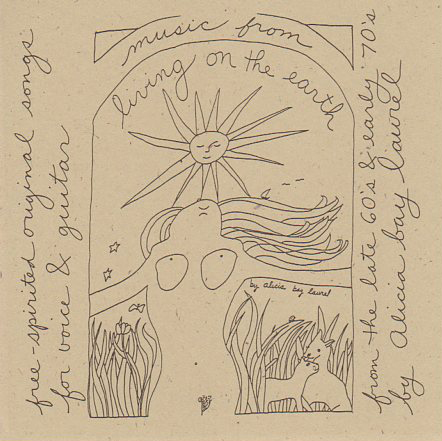 OK, I may be just speaking to my fellow aging hippies out there, but I want everyone to know how pleased I was to discover that Alicia Bay Laurel’s “Living on the Earth” has been re-issued in a special 30th anniversary edition. For many of us who came of age in the 1960s and began our journey through the various crafts in the early 1970s, “Living on the Earth” was both a roadmap and a bible. 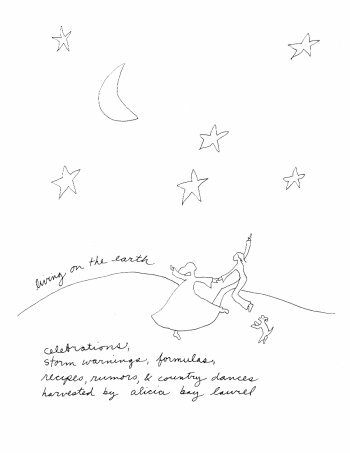 This book, written entirely in Alicia’s own cursive script and illustrated with her charming line drawings, was intended to be the definitive guide for sustainable living. And for may of us it really was. I cannot imagine how many people were inspired by this book to try their hands for the first time at sewing, dyeing, weaving, pottery-making or even candle-dipping and sprouting our own veggies. Everything she described seemed so infinitely possible. So we just plunged in and did it. Didn”t wait for anyone’s permissions. I can remember in my pregnant hippie days constructing most of my maternity clothes from the patterns in the book. (And yes, I really did have a tie-dyed maternity top). The first dyeing I did was by following her instructions for tie-dying. There was a pattern for constructing a simplke Inkle loom, and instructions on how to make simple musical instruments from items around the house. Learned from this book to distil rosewater, for example. I am so pleased that the book is back in print again. Of course this time it costs $12.95 instead of the $3.95 my mom paid for the copy she bought me back in 1970. The new edition is updated, taking into account some technological innovations and new ecoogical concerns that have arisen in the last three decades. But its lovely heart and soul are still intact. Here’s a URL for Alicia Bay Laurel’s own website. And you can buy the book through this site. Ah, I am filled with such nostalgia! I made an inkle loom and many belts. My son made a red, white , and blue one and almost got kicked out of school for it (that’s how it was then). I’m going to get the book and share it with my grandchildren. I love the site of Alicia, yes nostalgia, I presume. Our childeren say my husband and I are still hippies, but I think many things are different now. I have cut down at doing everything myself, growing my vegetables becomes heavier, and I buy some of my clothes now. And I use our computer quite a lot. When I’m not making the folk festival circuit, I’m a student at SUNY Geneseo. I’m an Art major/English minor, but I have no idea where I want to go with that since I’d rather be living out of a van with a guitar, a change of clothes, and a jar of peanut butter to keep me alive. I thrive on unusual books. Any suggestions are welcome, since my “to read” pile is gradually decreasing to the size of two small rooms. Most recent books I’ve read: “Living on the Earth” by Alicia Bay Laurel and a collection of humorous essays by Mark Twain. My only dream is to ride freight trains across the country with my guitar. If I never do another thing afterward, I will have lived more than everyone on this campus combined. Early last week, I picked up a book “Living On The Earth” by Alicia Bay Laurel. Very sixties, very countercultural, especially in this sense: It practically teaches you the skills to survive and enjoy life completely off the grid, or at least as far off it as you want to be. It isn’t a book about “survivalism” practiced by militias and wackos. It’s all about forging a good life outside mundane society. It doesn’t promote revolution, it creates revolution by giving you the tools to live the good life without J.C. Penney, Nike, Stop+Shop, The Gap, and Microsoft. And again I ask…how independent are you? I have always loved this book. It rings true and honest, advocating a simple, celebrate-life existence. Subtitled, “celebrations, storm warnings, formulas, recipes, rumors and country dances”. 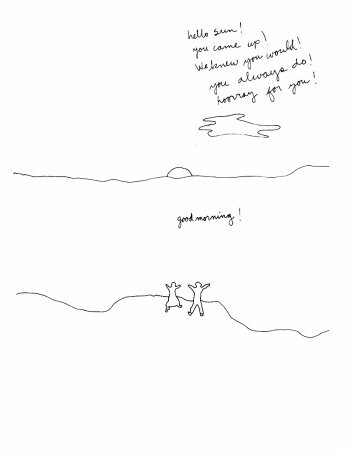 Quirky line drawings by the author. 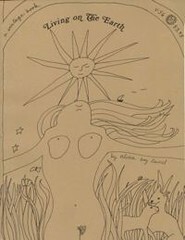 Cover drawing of naked woman in reverance to the sun. Overall a bit worn and well-loved. Several dark spots on cover. ” hippie: an open hearted being striving to develop a soul`s link to the divine. It is not the destination, it is the journey and here are some books for the trip!!! You have no idea how delighted I am to receive this email response. Your book holds a very dear place in the warmest part of my heart. It was given to me by two of the sweetest friends I have ever known but with whom I have lost contact. Your book continues to inspire and validate the most relevant part of who I am as a person – encouraging, light, fun, curious, forgiving, tolerant, creative, hard working, musical, and loving. I am 5+ months past treatment for cancer and having that book makes me less worried about outcomes. The circle of life resonates with me now in all things and your book, your simple, amazing book with it’s crazy, free form, looping pen draws that circle for me in my mind. It is stored away in my attic and I’m getting it down just to hold itÂ’s richness in my hands once again and perhaps try to find a recipe for something yummy. Thanks again for the book and for being such a positive, loving, and very special part of my life for so very long. I have read a lot of books in my life and some I’ve even kept for some time. But Living on the Earth is the one book I will never lose – even if I give it away to someone I love – because it lives in my heart. I just wanted to let you know I’m enjoying Living on the Earth tremendously! The illustrations are incredible and your flowing, poetic writing style is like a window into your spirit 🙂 Thanks for the lessons in enjoying this Earth of ours, I’ll definitely put them to good use. Awww, I am so touched to hear from you. I do love your book, yet am now finding though I enjoy just having a lovely thing, I would rather pass it on to someone who will use and gain from it. And your book is one whose time has come again, the current younger generations desperately needing classic natural and self help knowledge. There are some around here who don’t even know how to prepare a carrot or sew on a button. My sights are now on writing into the world my views on life’s consciousness and how e.g. plants through their flower essences are helping us to develop into a new stage of unity consciousness. Perhaps you know the work of Peter Russell. Whatever you are up to these days I wish you the very best and thank you for your wonderful book which helped encouraged me on my direction in my youth. Alicia Bay Laurel, in my opinion, is the world’s sexiest woman. Equal parts hippie chick, geisha, and earth goddess–a total babe. When I met your book at my age 14 at Manpei Hotel in Karuizawa, it changed my life. Until I met your book, I was living in a pretty regular, standard Japanese life, and had never thought about living without any electricity and at that time, your book left my mind very different experience for me. And I was happy to know there will be a world somewhere, people is living freed from controlled system. So, your book has changed my life and widened my soul. I donÂ’t know how I can express my excitement inside of me, when I met your book in my teenage time. I love all of your words, drawings and life style in your book and your book made small Japanese girl dreamed about beautiful people and community existing in this world freed from all gravity. I feel light going forward even when I am in a dark world. You show me beautiful things in this world all the time. Tasnim Janice Burton This book played a major role in my development of living lightly on the earth and my creativity. Alicia ~ oh, I loved your book! So basic and primal, showing us how to live in harmony with nature, in beauty. It has been a thrill to find you on Facecrack carrying onward! Yuka Hoshino I love your drawings. They really make me feel we are loved by the Earth and the Universe. Living on the Earth is the art of love. Deborah Derr I just found the greatest treasure ever! Your book, Living on the Earth!!! Wendy Green: My slow life mentor!! The seeds you planted in me in the 70’s have blossomed into a full fledged off grid lifestyle since 2005. Forever grateful. Jane Eagle: I still have my copy of Living On The Earth; love it always! Barbara Gettes I’m writing to tell you how thankful I am for coming across your book Living on the Earth. I discovered it initially years ago at my friend’s farm (and my ‘home away from home’) in New Hampshire. With no exaggeration your book changed my life coupled with the first year I spent a summer on The Farm. So thank you, thank you for that. I never thought to actually just contact you! Kerry Lee Hoffman Thank you so much for writing and drawing Living on the Earth. Who knew that a hippie chick from a commune would change the direction of my entire life? Mea (founder/director of the Spirit Weavers Gathering) I was in a bookstore in Pasadena CA back in 2005 and found Living on the Earth. I could not believe my eyes with what I was seeing. LOTE resonated with every cell of my being. 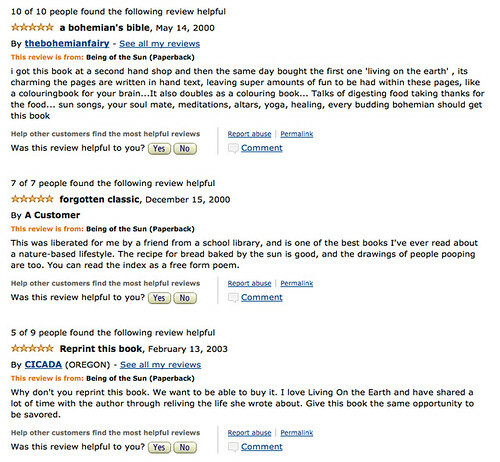 I bought the book and went home to find used copies on Amazon. I literally bought 25 of them (at that time they were like 2.99 on Amazon used). I gave them away that Christmas to all of my favorite humans. They were all also blown away by the book and many of us went on to buy 1st edition prints of many of your books. I know a few of us that have at least 4! I believe that this find of your book on this day opened up some magic that was hiding for many moons! I posted about your book on my blog and met Sophia Rose a year later. I love that you two have connected and I love that you are interested in Spirit Weavers. I have traveled with your book and have probably gifted away over 50 books over the years. Truly! And, I want to share that part of Spirit Weavers is really inspired by Living on the Earth and the back to the land movement that is now awakening again. We would love to have you join us; that would be beautiful! Its so beautiful to connect with you here as you have inspired so many of us! It was very joyful time with you at Iwaishima. Thank you very much for sending me your CD’s. I can feel your life with art and joy. “Thank you so much for coming to Iwaishima! This Birthday (42 year’s anniversary) is very special for me. And your talk about your life, American history, Hippy history and so on, were also big gifts. Today I also got your nice book. I feel my life is opening to new world. “Thanks again! I hope we’ll see you again. “Your song and your practice are prayers for peace. She also said that your live songs are so wonderful. She loved to listen to the live music. Unplugged. I hope you are well, and keep on Living on the Earth! today i had the extreme honor of meeting this lovely human, Alicia Bay Laurel. it was a wonderful opportunity to thank her for the inspiration that her book provided me: to build gardens, make babies and do art. KC Williams I would love you to sign this for my daughter, Lily. I’m giving her books for Christmas that meant a lot to me at the same age (17) as she is now. And I used to sit with your book for hours, back then. Thanks so much!!! Brynda Bechtold I mentioned you today while shopping in a health food store with my daughter in Savannah. That I had made my own essential oils and soap back in 1971, 72…and how your book “Living on the Earth” told me how to do everything. Val Greenoak I don’t think there is another book that expresses my hippie sensibilities as well. It is on the shelf with a few other real classics of the era that still hold up. Dog-eared? Yes. Still need to find the picture of my now 46-year-old son wearing the shirt I made for him from an Indian bedspread from a newspaper pattern. You taught me my first primitive skills. Love to you Alicia!!! Celine Richwine I had one of the original editions in the very early ‘70s. I spent hours pouring over the book and wishing I could live that life. It took awhile, but I’m doing it now! Lucy Logsdon I have used your book as an example for my rebel step-grrrls of how helpful humans can be, and what kind of work can be published instead of useless rubbish. Steve Filby I remember a photo of you now playing your guitar with Juliette Bairacli Levy in her later life. She was a wonderful lady too. Juliette’s granddaughter Adaya was searching for her grandmother’s early poems, many about gypsies in booklets The Cypress Wreath & The Yew Wreath. She is using them as lyrics for her new songs. Luckily we had copies of these poetry books & were able to photocopy & send them to her, as there were no copies available. It is always the simple gestures that give the most satisfaction in life & it was lovely to be able to help. Wishing you well on all your amazing projects, Alicia. Keep up your lovely work; the world is definitely a better place for it. I think we need more people like you in this world. Love & peace to you, Steve. Claudia Joseph My older sister probably bought your book. I claimed it and it did help lead me to Permaculture. I remember we made the peasant blouses. It is on the shelf in my kitchen after traveling to CA and back east again. Not in storage like dozens of other books I own. I treasure it. A true inspiration. Thank you so much! Nancy Taylor Alicia Bay Laurel, your art deserves to be acknowledged. Not only did I pore over your books, but my now 29-year-old son loves them too! In fact, he keeps asking me for my copies. Love you. Courtney Girouard I absolutely love this book and am so giddy to see there is a FB page for it. And with good reason there should be! This is an all time favorite, well traveled and reread through the years, must have book I adore. Russell Fuller Alicia, I’ve long lost track. Decades, right, but thank you for then (when the original book was a regular fixture), and how nice to see you now, vibrant as ever. The kitchen where a bunch of us spent a good deal of time, and still spend some, turned 45, last summer. New oven now; it still uses propane. Alicia Bay Laurel Thank you, Russell. It first was published in September 1970. It’s still selling in English, Japanese and Korean. It was selected as one of the 101 most influential American cookbooks of the 20th century (and it’s not really a cookbook). It’s currently displayed in three museum exhibitions about the hippie world. I’m writing a 50 years later sequel, since I once again find myself in a situation in which I, and many others, are wondering how to survive. Sophia Rose I’m so honored to know you and to share such a deep appreciation for one another’s work. I was sharing your books last night with someone who was just seeing them for the first time. It was such a treat to get to read your words and see your illustrations with fresh eyes. I love you Alicia. Varda Steinhardt I’ve had that book since about 1975. Was just moving & doing a big (very painful) book purge. Picked that up from a bottom shelf… husband pointed to “toss” bin. I clutched it to my chest & said “not on your life!” In 1976, I was a 16 year-old vegetarian feminist hippie-holdover high school girl with hairy armpits, reading tarot cards & casting astrological charts for my friends & trying to survive in the disco-era suburbs. Your book was my bible. 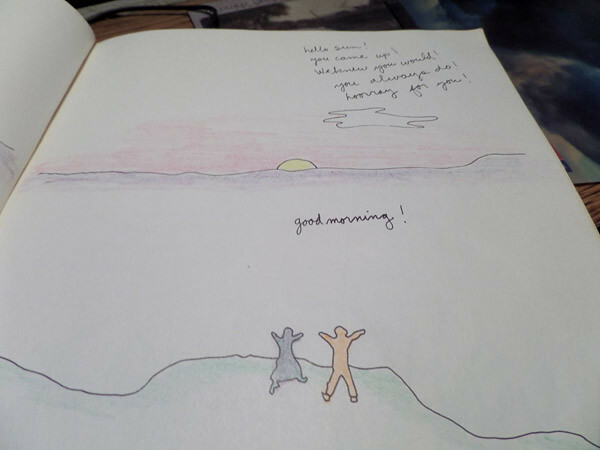 Becky Brown Your Living on the Earth book was (and is) one of my treasures. It’s a little tattered, but I still enjoy reading it and looking at your drawings. Tina Carlisi I am an artist from Montreal, Canada and I am also currently doing my PHD in fine arts. My artistic and case-study based dissertation is an exploration of the lessons that can be learned from communes (established during the counter culture as well as more contemporary ones). Part of my focus is also to gain more insight from women’s perspectives and experiences which has been underwritten in or excluded from existing literature on communes. Living on the Earth is one of my favourite poetic and practical books which has had a profound impact on me as an artist and as an individual. Hi, Alicia! It was so nice reading through Living on the Earth and knowing that it is possible to live that way! I am 22, just getting into the hippie scene, and I am fascinated by all the things they did and all that they had going on! What did you do for fun in the 60s & 70s? Currently, I am working my way through the Magical Books you had listed in LOTE. I am on The Hobbit right now and just finished the first Dragon Riders of Pern volume. Wow Sarah! What a lovely letter! May I post it on the reader feedback page on my blog? What we did do for fun in those days? Play and sing live music together. Dance together. Go to hot springs and do sweat lodge ceremonies. Hike in nature. 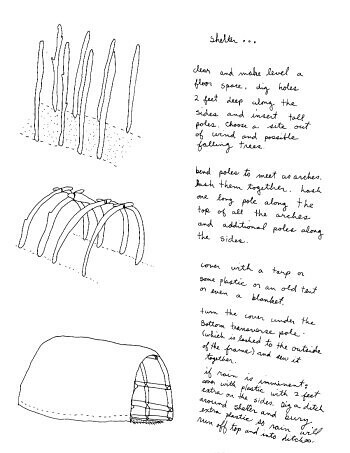 Make things – crafts, food, gardens, shelters. Do yoga. Go swimming. Have potluck meals together. My personal hobbies are visiting shrines of culture and visiting shrines of nature. Going to places that astonish me. A book can also be a shrine of culture – so can a performance or a movie. Ayer fue mi cumple y me regalaron esta maravilla de @kachinaediciones. Por favor, ojeadloen vuestra libreria de cofianza. Yo estoy que me da un soponcio de amor.